Turn those goggles off Sam, they'll see you coming a mile off. Spies come in many forms, so the best spy games on PC could be tense games about intrigue and infiltration, or high octane adventures starring a special agent. 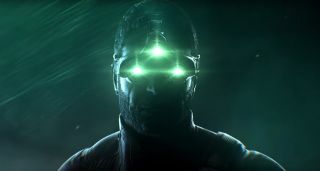 It would be good to see more games focusing on spycraft, espionage, and subterfuge, but we can make do with putting on some cool glowing goggles to infiltrate a base. Here are some of our favourite games starring awesome spies. A gloriously janky RPG from Obsidian that casts you as crack spy Michael Thorton. This was a brave attempt to combine Mass Effect style conversation and branching plot systems with a cover-based shooter. The combat side of things is a mess, so it’s worth looking up the different weapon classes so you know which disciplines to avoid (I found pistols worked well enough). It’s worth playing through the dodgy action to roleplay your favourite flavour of spy—pick your JB: Jason Bourne, James Bond, or Jack Bauer. This classic stealth sandbox came out 13 years ago, but still perfectly captures the thrill of being an action movie covert agent. It’s like Hitman, but you have cooler gadgets and the ability to suspend yourself above guards by doing the splits. Paranoia is an important part of being a spy. Your cover could be blown at any moment, and the consequences are drastic. In fact someone could be watching you through a high-powered scope right now. SpyParty captures this feeling in a series of small scenes—a party in a pub, a penthouse party, a boat party (spies love to party). One player plays a sniper, assessing the scene for any signs of spy-like behaviour. The other player is the spy. As the spy you have to blend in with NPCs as naturally as you can while you saunter around completing secret objectives. Infiltrate high-security environments as a group of specialists in this hybrid of stealth game, turn-based strategy and roguelike. Get in, run the job, then get out again, and use your agents' different abilities to make it happen. This is a meticulous spy game where every wrong move can cost you dearly (you can rewind a turn if you've messed up that badly), but every well-executed strategy will make you feel like a badass. Sid Meier’s spy game was remarkably ambitious for 1990. You investigate randomly generated missions by infiltrating facilities, planting bugs, stealing files, tailing suspects and decrpting codes. Each of these activities has its own minigame. To decrypt a code you have to decode a scrambled message under time pressure. To infiltrate a building you pick a loadout, slip into the premises and start photographing documents with a microcamera. Set in Russia during the last days of the Soviet Union, this brutally difficult point-and-click adventure sees you investigating corruption within the KGB—at least to begin with. Over the course of the game, protagonist Maksim, a KGB captain, finds himself swept up in a conspiracy involving the murder of a former agent. Steal secrets in (former PC Gamer staffer) Tom Francis's stealthy puzzle/platformer, where you play a spy who can hack and control different parts of a building's security system. What I remember liking about Gunpoint more than anything is its length—you'll clear it in about three or four hours, but in that time you'll go from being shot dead a bunch of times by guards to perfecting its systems and skilfully bounding in and out of buildings. It's perfectly paced, with no unnecessary levels or dull bits. “Tactical Espionage Action” is Metal Gear Solid’s tagline. In some ways the first game captures the spy fantasy better than the rest of the series, because in MGS Snake is an underdog rather than a legendary battlefield soldier. Snake’s hushed conversations with his handlers over intercom create a sense that you’re camped behind enemy lines, and it’s a dedicated stealth game. The worst thing you can do is get spotted by a guard. That brash alert noise is burned into my brain. A cyberpunk spy thriller that pays homage to Deus Ex, Neon struct is a slick heist game that challenges you to complete missions non-lethally. You have a bunch of sci-fi gadgets that can scramble gadgets and turn lights off at range, but its best move is a totally silent slide move that can get you out of trouble.